Once upon a time, a young adult man decided to take a journey to the imaginary place called middle earth, a world where lord of the ring exist. Even though the name is middle earth, it was actually located in the southern part of the earth (don’t be deceived!). He just got a mail from the hobbits to help them looking for the lost ring. A ring which would give unlimited power to the owner. The man didn’t care with the ring actually. He was more interested with the beauty of the middle earth. He packed his bags, bought the ticket and applied his time off. "Follow my preparation before traveling to Middle Earth aka New Zealand and some cities in Australia"
New Zealand is worth to visit for all year around. You can go there during summer (Dec-Feb), Fall (Mar-May), Winter (Jun-Aug), and Spring (Sep-Nov). The best season is summer because you can get long day light (Night started at 9 PM! 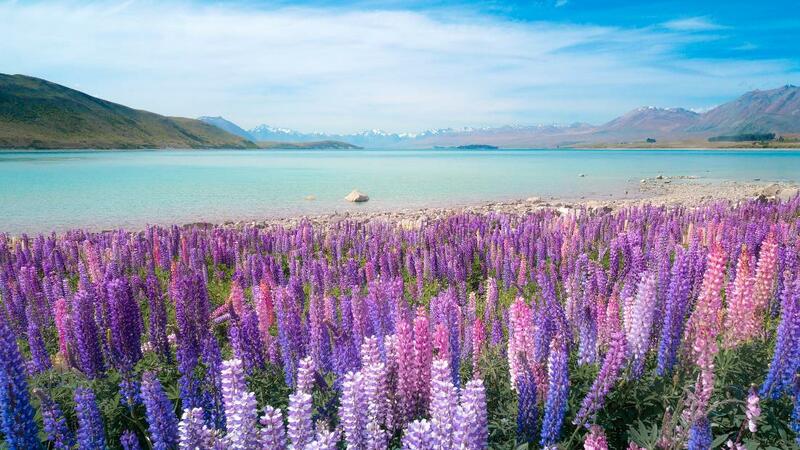 ), low precipitation rate and also the Russell Lupin flower is full bloom during summer (Late November – early January). The disadvantages of visiting in Summer is crowded especially during Christmas until January. School holiday is also started at mid December. In fact, the land is still big enough to accommodate the tourist but not for the accommodation. Better you book accommodation in advance. Another bad news is the flight fare. It is also not cheap during peak season. After I did some research in the Internet before went there, i decided to start my trip on 28 November 2015 through 12 December 2015.. It was just before people starting their holiday so the ticket fare still made sense and it was summer! However, my instinct said that i still had to book accommodation a month before. Taking time off is a main issue for me to make a trip. I was only (ONLY!) able to take 16 days off for this journey and it was not easy to get it. 16 days is a long holiday but not for this trip. I need to cover 2 countries and 13 Cities in total so it was very tight Schedule. If you have the same problem with me, let’s travel together! Sydney is a city on east coast of Australia where the most famous landmark of Australia, Opera House, is located. I Transited in Sydney for 2 days for enjoying the city life and some beaches. The most stunning lake i ever seen. You can expect the blue coloured lake, the snowy cape mountain and million Russell Lupin flowers. The place is part of Aoraki Mackenzie International Dark Sky Reserve. The highest mountain in New Zealand reached 3724 ASL. Sir Edmund Hillary once exercised on this mountain before conquered the the highest point in the world, Mount Everest. I only transited in this city for waiting my next bus. The city is small and very peaceful. Unintentionally, I found a river with thousand Russell Lupin flowers while i got lost. Queenstown is the place for adrenaline junkies. I took tour package for Milford Sound one day trip. Milford sound is a Rivendell, the home of thousand waterfall, in real world. 2 hour driving from Queenstown. The city is smaller than Queenstown. I came here for 6 hours trekking to Roy’s Peak. Roys peak is located around 6 km for city center. Franz Josef and Fox glacier is well known as the second best drop zone for skydiving after Himalaya region. I’ve done my first skydiving here. It was crazy and awesome! The geographical “Center of New Zealand” allegedly lies in Nelson. There is a monument on top of the hill nearby with city center. The city is also located nearby with Abel Tasman National park. It takes 3 hours sea journey from Picton to Wellington. It’s not a ferry actually but a Cruise! Sometimes you can see whales along the journey but I was not that lucky at that time. If you remember the scene in Lord of the ring movie when Bilbo baggins threw the ring into volcanic mount aka mount Doom, this is the place! You can hike up and down the mountain for 1 day. The Largest metropolitan and most populated City in New Zealand. You never believe that the city is surrounded by a volcanic craters. Currently the crater is used as public park!! The most livable city in the world. I arrived midnight and then try to walk around the city. The temperature was too cold to walk outside at that time. i got stuck in the fast food restaurant then. There are no low cost airlines going directly from ASEAN country to New Zealand. It has to make a transit in Australia. I took flight from Singapore. Luckily, I got cheap price from Flyscoot, around 180 SGD or one way to Sydney Australia. Another good thing is flyscoot using Boeing 787 Dreamliner! I was very excited with this plane. You can count Jetstar or maybe Airasia from Bali and Kuala Lumpur also depending which airlines offer good price. From Sydney, Australia to Christchurch, New Zealand, I flied with Jestar. One way ticket was 130 NZD. Flied back ticket was more expensive, 180 NZD from Auckland to Melbourne by Jetstar and 210 SGD for Melbourne to Bali by Airasia. Be careful! The rule for 7 kg cabin baggage in Australia and NZ is very strict. Your belonging will be checked just before immigration by airport officer. Even I threw my pants and some foods because of it. There are 5 common option that people take to travel around the countries. Rental Car – Either Minivan or car, this option is good if you travel in a group. Hop on and hop off Bus – it is recommended for you who travelling solo and don’t want take time for planning your trip. Some provider available like Kiwi Experience and stray However, the price is still too high for me. Hitchhiking– It is very easy and pretty safe to do Hitchhiking in New Zealand either with local or others tourist. I've done 3 times during this trip. However, you have to be careful also because not everyone is kind and sometimes there is something behind the kindness. Point to point bus – this is my best deal! Just common bus between the city and it is cheaper. There are some provider but the widest network is Intercity and Naked bus. I chose naked bus because of it was super cheap especially when you buy their passport. A lot of option for naked passport so choose your preferences. The Naked Passport cost me 199 NZD (promotion price) for 10 trips including Interislander ferry return. However, I still needed to buy bus ticket to another provider like Intecity and Cook Connection because Naked bus services is not available for some city but it is still worth it! Intercity has wider network comparing with Naked bus. All of accommodation in New Zealand is very reliable. They know how to treat tourist. They are very kind and helpful. The most important is Kitchen and wifi network. Kitchen is crucial because you can expect more saving if you cook your own food. Some hostel doesn’t give free of charge wifi to the guest. All of accommodation was booked from Booking.com. Sydney– My friend’s room. free of charge! Christchurch – Airport. free of charge again! Tekapo Lake – YHA Tekapo (33 NZD). Full facility kitchen, free wifi and best location. Very recommended. Twizel – Riverside. Free of charge! Queenstown– Absoloot Value Accommodation (27 NZD). The location is just beside the lake! Cook your own food. It probably will save more than 50% of your meal expenses. Sometimes, site like booking.com give some random promotion. Just book your accommodation early. then re-book again when it has discount. Wanaka– X base Wanaka (30 NZD). The worst Kitchen ever during my trip and the payable wifi! Franz Josef – Franz Josef Montrose (21 NZD). They provide free soup every night! Nelson– Tasman Bay Backpackers (27 NZD). They provide free Chocolate Pudding every night! Tongariro Crossing – Bus stop in Turangi. Not kidding. Free of charge and there is free toilet nearby the bus stop. At night the town was very silent but sometime heard unnatural sound...scary! Auckland– My friend’s room. Free of charge! Melbourne– Fast food Restaurant. Just bought cup of tea then I slept there. For me, food plan is important and must be included in the itinerary. Since i am only able to eat halal food, i usually prefer to be a vegan, cook my own food, eat seafood, bring some food from my country or look for halal restaurant. Australia and New Zealand are one of meat exporter to Middle east and ASEAN country so halal meat is common in this country. However not many restaurant provide hall food. In Australia, It is pretty easy to get halal food since a lot of student from Indonesia and Malaysia or immigrant from middle east. so no need to worry while you travel in Australia as long as you have located the halal place before you go. In New Zealand, It is quite difficult to get halal food especially in south island. The easiest place in New Zealand to get halal food is only in Auckland. What i did during this trip is cooking my own food. All of hostel in New Zealand provide communal Kitchen facility. You may buy your ingredient and a pan in closest supermarket. I am really hate to talk about Budget so i put this section in the last. Sometimes, it make me looked rich (I'm not rich but handsome) or restrain person to go traveling. We can't agree more that New Zealand is expensive country (even an European said like that) especially for citizen from Indonesian like me. with 5 dollar, i may get proper meal for a whole day in Indonesia but in New Zealand, I'll only get 1 piece tuna subway sandwich. However, traveling to New Zealand is worth for your money. It is expensive but it's worth of your life. Really! the country is very beautiful. You may travel as budget as possible by cooking your meal, staying with local, friends or even homeless, hitchhiking, looking for promotion etc. You may check www.bookme.co.nz, they often give discount price for several activities and tour. Below is breakdown for my spending in New Zealand so you may consider that it is already cheap or not. Woww so nice to find your blog! I am planning to go to this beautiful country. Hope we can get in touch so that I can ask you some pending questions of mine. Tq! Hi nurul. sure! will glad to answer any question from you. Hi! Do u need visa to travel to Auckland from Australia? I am from Malaysia. Thanks! yes, i need a visa for travel to new zealand from any country or even have australian visa. i think malaysian no need, right?